Fits all 1966-1976 2002/2002ti/2002tii and 1600-series models. 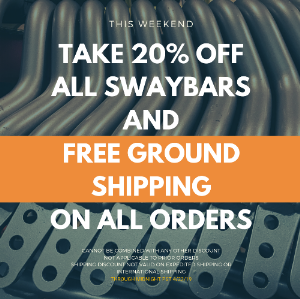 Created, designed, and manufactured by the leaders in aftermarket upgrades for BMW, the SwayBarbarian delivers superior quality and the ultimate in sway bar performance. What do Anti-Roll Bars do? UUC SwayBarbarians improve handling by minimizing the lateral traction-robbing body "lean" that rolls part of the outside tires off the pavement. By replacing the narrow OEM bars and rubber bushings with larger diameter (stiffer) alloy steel bars and polyurethane bushings. More roll stiffness means more roll resistance and less body "lean", and the tires stay flatter on the pavement (maintaining a larger contact patch). The result is more lateral grip and added chassis control. UUC SwayBarbarians are cold-formed using custom-built precision bending equipment. Laser-cut bar ends are MIG welded in place using a precise fixture for an exact fit. Powdercoated chromoly steel bar material. Urethane bushings, hardware kit, and lubrication included. We use the highest-quality materials in our product manufacturing process, and follow a rigorous testing regimen to ensure the final release is the strongest, most durable product possible. 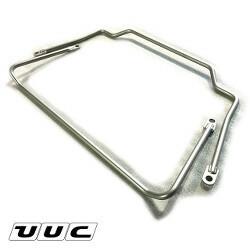 Chromoly steel for the bars themselves, aircraft-grade urethane for the bushings, and professional racing-quality links and bracket pieces are all standard parts of the package. A silver powdercoat is applied for a smooth, long lasting finish. This durable finish allows the bars, when properly installed with polyurethane bushings and grease, to deliver long term performance with minimal maintenance. The SwayBarbarian kit includes replacement polyurethane bushings, which are built to "aircraft spec" (literally - our urethane fabrication facility uses the same material and production guidelines as they do for Boeing). This results in a durable bushing that will not disintegrate and has extended re-lubrication intervals for long-lasting, quiet results. From Anonymous of Hartford, Connecticut on 8/23/2016 .